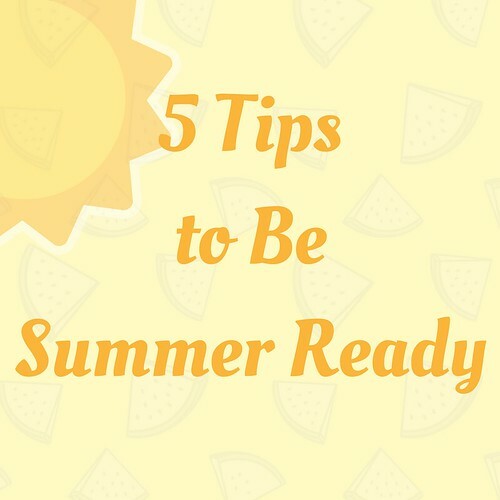 Take these 5 Tips to Be Summer Ready with Tupperware Brands Philippines! Are you feeling this weather? It's been absolutely hot recently and humid at the same time. The sun has been extra hot and really shining out in all it's glory. As a woman, you need to protect yourself and make sure that your skin is ready for this heat. I'm a daily commuter and the last thing you want to be less prepared. I have the perfect essentials for you with the help of Tupperware Brands Philippines to make sure you are ready for the Philippine's summer. 1. 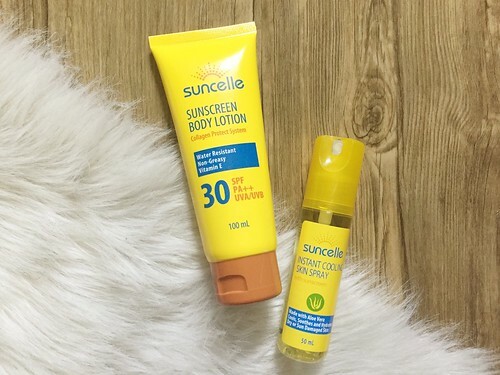 The first question with this heat is: How do I protect my skin?Super unbiased here but I trust and love the Suncelle products - the Suncelle Body Lotion (SRP 399Php) is a water resistant, non-greasy lotion which is enriched with Vitamin E. You get a 30 SPF, PA++ and UVA/UVB protection that can help protect your skin. With the Collagen Protect System this lotion helps protect your skin from wrinkles due to sun exposure. We all need to be careful with taking care of our skin at these times. Another super fave of mine is the Suncelle Instant Cooling Skin Spray (SRP 299Php), this spray instantly helps to cool, soothe and hydrate your thirsty skin when exposed to the sun. 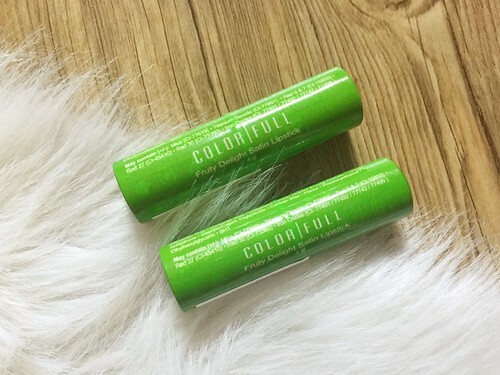 This is made with Aloe Vera which is a perfect ingredient to lock in moisture. I would bring this along to spray over my legs and arms after a walk under the sun. 2. How do I stay fresh? Let's start off with the right powder. Use Cool Splash Cooling body powder with SalScent - which is a technology which releases fragrance when you perspire. So it will make you feel confident (especially during those MRT rides). 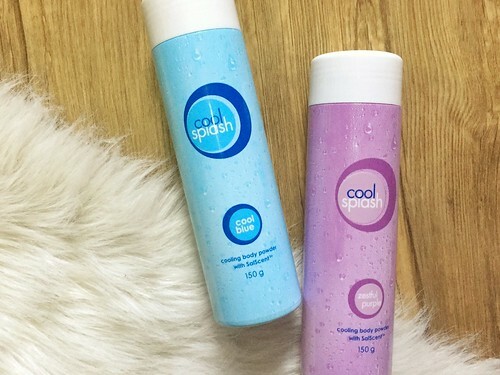 Cool Scent Cool Splash cooling powder comes in two scents: Cool Blue and Zestful Purple. My personal favorite is the Zestful Purple which is a feminine floral scent. I would have my husband use the Cool Blue scent which gives off a sweet musky scent. Use these after bath to keep you smelling fresh (SRP 240Php). 3. After a walk doing errands, the 3rd question is: How can I give myself a quick perk-me-up? 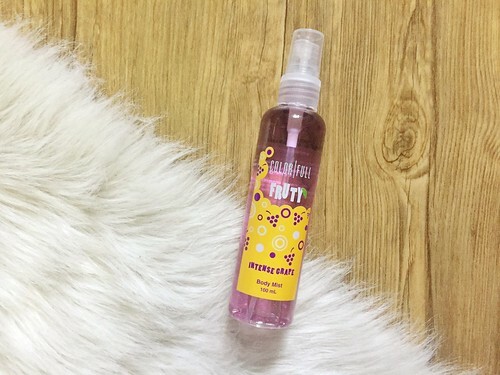 Keep a bottle of the Color|Full Fruity Intense Grape Body Mist in your bag (SRP 380Php). This floral fruity scent will instantly make you feel fresh and you will feel energized after a few sprays on your pulse points (wrists, back of the ears and ankles). 5. As a mom, and with summer workshops on going, another essential is to make sure you have packed everything you need to take with you. Hello Expandable Bag! From taking trips to running errands this is the perfect bag to bring with you. All you need to do is to unzip to expand! 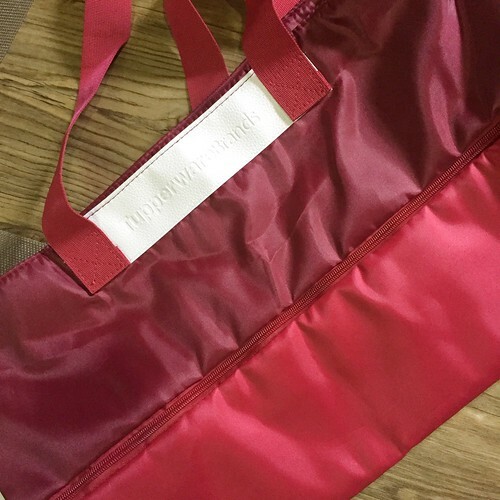 I love this bag not only because it's useful but it is super lightweight too. It's regular retail price is 1,099Php but if you buy 500Php worth of products from the April 2018 catalog you can get it for only 349Php! Don't waste time and make sure you are geared up for summer with these tips I gave you and check out Tupperware Brands Philippines April 2018 online catalog because they are selling the items I mentioned at promotional prices, get as much as 461Php of savings! Stay up to date with Tupperware Brands Philippines promos by following them on Facebook, Instagram and Twitter. You can also visit their website for more products. What's your favorite Tupperware Brands Philippines product that you use and why? Share below and I will pick one answer to receive the Color|Full Fruity Intense Grape Body Mist worth 380Php and the Cool Splash Cooling Body Powder in Cool Blue worth 240Php! You'll have until May 13 at midnight to leave an answer. Only 1 entry per account, only verified accounts - no anonymous answers. Winner to be announced on May 14, 2018. Hello Mommy Marie, thanks for sharing your tips on how to beat the heat. As for me, I love the set of Tupperware Kids Plus+ Baby Powder, Lotion,Shampoo, Bath Soap an Cologne. These baby essentials is definitely highly recommended for our dear babies. All has mild scent and dermatologically tested especially for sensitive skin. This summer my kids are very active playing outside especially during afternoon. Madalas sobrang pawis sila after playing but thanks to Tupperware essentials they didn't smell "amoy pawis" though tagaktak talaga ang pawis nila. That's why we love these products and been using these for years. Totoong mabango ang Kids Plus products. :) Favorite ko na rin cya. Thanks for the reviews Mommy Marie..It will helps us to beat the summer heat and stay fresh and calm as the summer goes by..My favorite Tupperware Brands Philippines products are for me, is the sweet scent of a Little Romance body mist,it lift me up everytime I use it..Love the scent and keep me smell fresh all day long,and for my daughter is the set of Baby Pink Plus Powder,Shampoo,Lotion and Cologne..I've been using these for years na for her and she is delighted with my soothing touch with Baby Pink Plus Products. Nice choices! Glad to you an avid user of Tupperware brands! Ooohh love this mni review and glad to know na hindi harsh sa skin ang whitening products nila. Thank you Jhane, kilig naman ako! I love the baby powder too! Thank you sa review Mamanee...😘 Through your blog.,we learn alot of facts and useful tips on buying products..Nagiging wais mommy na tuloy kami..Bago bumili nagbabasa muna ng reviews..We love you mam.,Please never cease on providing us infos..Im not a user of tupperware products..Kasi medyo pricey..But base on comments and reviewS worth it nman po pala..I will start to try Suncelle products - the Suncelle Body Lotion..Mahilig ako sa lotion.,lalo na po pag smells good...Thankz again mamanee..God bless and More power..We Love you.. Yay!! Happy you loved the review hihi. Sending my love back! Suncelle product line is what I love the most because of the protection it gives from the UV rays. Since I am an outdoor kind of person it is very helpful. I love your honest review to all of these products. Very helpful especially to those who haven't tried tupperware brands yet. Salamat naman Jean! Yes, Suncelle is definitely my go-to product line for sun protection.
" Baby care plus + " lalo na ung white and blue na color. Super love love namin ng daughter ko ung baby care products ksi hypo allergenic and dermatologist tested siya kaya perfect sa anak ko ksi medyo sensitive ang skin siya , ung cologne nila my +hydraplus formula that contains moisturizer to help prevent dryness kya sure ako na soft and smooth parin ang sensitive skin ni little one ko, ung Powder nila my allantoin that works as an anti irritant to sooth and protect baby's skin while keeping it fresh and dry , low dusting formula that decreases the risk of inhilation . Mabango nga talaga ang Baby care plus saka maasahan na hindi ma harm ang skin ni baby :) Salamat Lyn! Thank you sa review Mamanee...�� Through your blog.,we learn alot of facts and useful tips on buying products..Nagiging wais mommy na tuloy kami..Bago bumili nagbabasa muna ng reviews..We love you mam.,Please never cease on providing us infos..Honestly im not a user of tupperware brand.Kasi medyo pricey.But base on comments and reviews worth it nman..Gusto ko itry ung Suncelle products - the Suncelle Body Lotion..Hilig ko kasi sa lotion..
when i was young my mother she used tupperware brand. dor all any kind of occasion. now they a lot of new things in this tupperware brand.. more power for the big company and more help benefits to the consumer your brand..
Ooohh I should check that out, mahilig din ako sa balm eh! must say that choosing the best and not harmful product for my daughter is what I adore with Tupperware Brands. I continued to use it especially Baby Care Plus, Kids Plus for my family's needs specially to my daughter. Their products are brilliant. It helps my little daughter skin look fresher and softer. I love their mild scent and they're the best we've ever used. I also love that they're safe and naturally works, giving the best value for money. I would highly recommend Tupperware Brands Baby Care Plus, Kids Plus and Mom Plus products to friends, relatives and to other parents. Now she's still using it at the age of 5. My favorite Tupperware Brands Philippines product that I love to use is the Black Jeans Fragrance Gift Set. I am keeping the body mist at home so that I will be smelling good before leaving the house and the pocket mist in my bag for touch up. This scent compliments my body's ph thus making me smelling good all the time. A fragrance that boost my confidence day and night! My favorite Tupperware Brands Philippines product that I use is the Suncelle Sunscreen Body Lotion with SPF 30. I am a daily commuter too and my shift is 1:00 PM to 10:00 PM. Going to the office made me exposed to the scorching heat of the sun that is why Suncelle SunscreenBody Lotion with SPF 30 this is my shield to be protected and maintain healthy skin. I am not getting any younger and with the best skin protection that I am getting from Suncelle, I am sticking to it until the end.